This book makes you want to run right out and cut a bundle of something to dry so you can make something gorgeous right away. The fact that this book was first published in 1987 and is still being printed is testimony to the valuable information and beautiful photos contained inside. 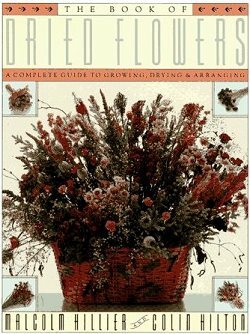 When the two authors first penned this book, they had already been in the dried flower business for 17 years. Their expertise and understanding of their craft shows in every word they write. Chapters include instructions for growing the plants, viewing what the plants look like when dried, choosing your wreath bases or making your own, constructing wreaths, hangings, bouquets, swags, and choosing containers for table arrangements. One of the best features is the chart at the back of the book that lists a hundred or more plants, their botanic names, which season to harvest the flowers or leaves and which drying method is the preferred for that plant. There is a short reference to potpourri with several recipes, as well as a couple of pages on pressing flowers. The section on Seasons and Special Occasions covers, not only the obligatory Thanksgiving and Christmas holidays, but gives innovative ideas for weddings. It is wonderful that the authors actually grow much of what they dry and that they air dry most of what they pick. Every page has a tip or set of instructions to make your arrangements with dried flowers both successful and fun. Additional books on crafting with herbs you may like!